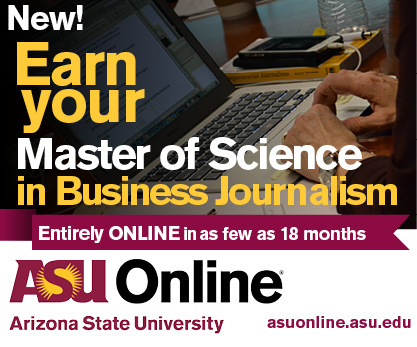 The new Master of Science in Business Journalism (MS) at Arizona State University is an all-online degree program geared toward journalists and communications professionals who want to develop expertise in business and in communicating about business, economics and finance in order to more effectively serve audiences. 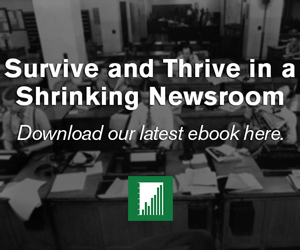 Students acquire the knowledge and tools required for reporting on the story behind every story: money. Unique to the program is instruction from two schools that are considered national leaders in their fields: the Walter Cronkite School of Journalism and Mass Communication, home to the Donald W. Reynolds National Center for Business Journalism, and the W. P. Carey School of Business. Students will study economics, finance, accounting, statistics, markets, and organizations in courses offered through the W.P. Carey School of Business, one of the nation’s leading business schools. And they will study how to apply that knowledge in a journalistic context through classes in data journalism, reporting and storytelling, media law and entrepreneurship at one of the nation’s leading journalism schools, the Walter Cronkite School of Journalism and Mass Communication, home to the Donald W. Reynolds National Center for Business Journalism. Delivered entirely online, the 30-credit program may be completed in as few as three semesters. Students begin the program with the 3-credit Issues in Coverage of Business and the Economy and conclude with an Applied Project that reflects the student’s particular area of interest. 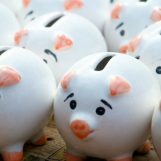 Other courses may be taken in any session in which they are offered except for the Basics of Financial Performance and Basic of Internal Measures of Success courses, which are taken in succession. Core Requirement: A bachelor’s or advanced degree in journalism or mass communication from a regionally accredited college or university or another degree coupled with some professional communications experience. International applicants must meet the admissions criteria of Graduate Education. No prior business training or education is necessary. GPA: Minimum of a 3.0 cumulative GPA (scale is 4.0=A) in the last 60 hours of a student’s first bachelor’s degree program. Minimum of 3.0 cumulative GPA (scale is 4.0 = A) in an applicable master’s degree. English Proficiency Requirement for International Applicants: International applicants must take the Test of English as a Foreign Language (TOEFL) and have a score of at least 100 on the internet based test (iBT). Students may have these scores automatically submitted to ASU and the Cronkite School by using institution code 4007. Deadlines: The Cronkite School Graduate Committee will review completed applications on a rolling basis; students may begin the program in the fall or spring. Applications for the fall semester are due July 15. 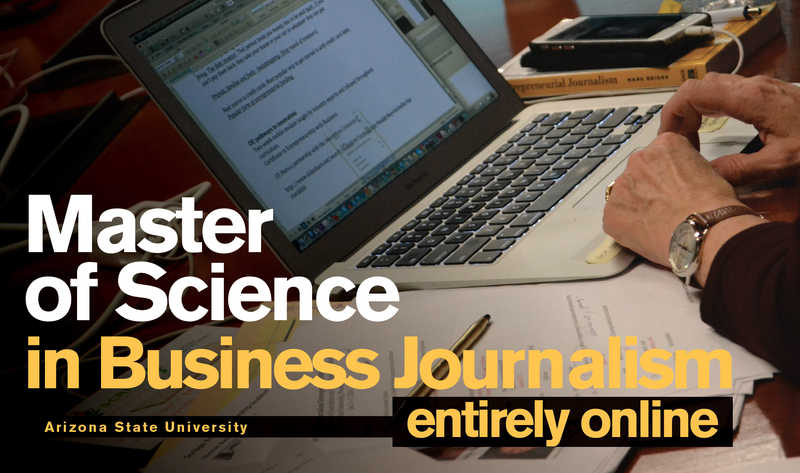 The Master of Business Journalism degree may be completed in as little as three semesters. Courses are delivered online in the fall, spring and summer semesters. All fall and spring semester online courses take 7.5 weeks to complete. Session A courses are taught in the first 7.5 weeks of a regular semester and Session B courses are offered in the second 7.5 weeks of a regular semester. Summer courses are completed in 5.5 weeks. • MCO 550 Issues in Coverage of Business and the Economy (3 credits). Students examine and analyze how business and economics are covered in the U.S. and abroad and gain a basic understanding and vocabulary for coverage of financial markets, economics, company statements, banking, credit markets, IPOs and mergers, real estate, global trade and the structure of public and private companies and non-profits. Note: MCO 550 must be completed during your first enrolled session. • MCO 551 Better Business Reporting (3 credits): This course provides training and practice in reporting and writing stories related to business and the economy. 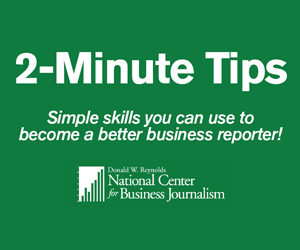 Students learn tools and techniques to enhance their coverage of various kinds of business stories, from profiles to financial reports. They learn best practices for pitching stories, cultivating sources, conducting effective interviews, structuring stories, using appropriate narrative elements and translating complex information for a general audience. Note: Students must have completed MCO 550. • MCO 503 Media Law (3 credits): This course teaches an understanding of laws associated with freedom of expression in the U.S. and how such laws vary in other countries. Students examine court cases related to freedom of expression and look at legislative and administrative regulation of mass media in the U.S. and elsewhere. Included are consideration of laws related to privacy, libel, defamation, obscenity, public records, trials, public meetings and intellectual property rights. • MCO 556 Media Entrepreneurship (3 credits): The goal of this course is to familiarize students with media entrepreneurship and innovation in a quickly changing digital media environment. Students study the principles of entrepreneurship and innovation, assess their own tolerance for risk, evaluate opportunity and market conditions, and learn about various revenue models for entrepreneurial enterprises. 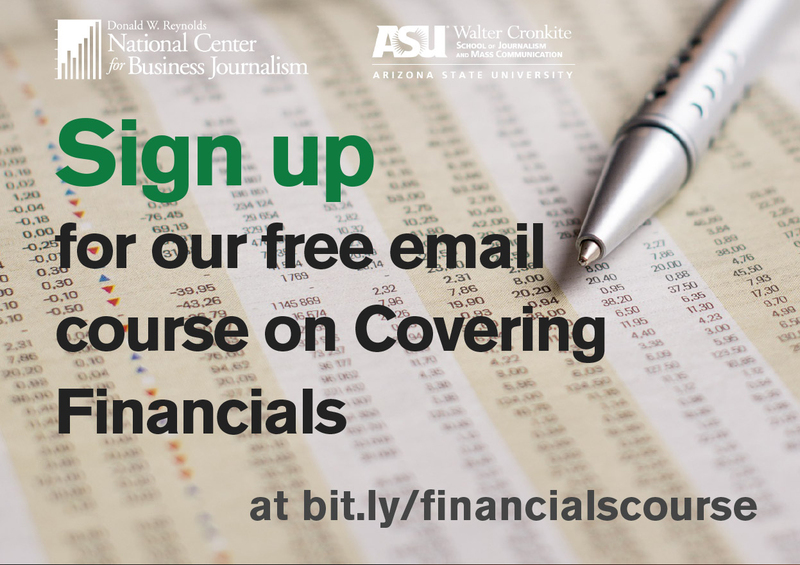 • MCO 552 Data in Business Journalism (3 credits): Students learn how to find powerful business and economic data from U.S. sources such as the Census Bureau, the Bureau of Labor Statistics, the Securities and Exchange Commission and the Federal Reserve. They also examine international data sources of the United Nations, the World Bank, the European Union and the statistics offices of various countries. They learn basic mathematical and statistical formulas for working with business data, how to find stories in data using tools such as Microsoft Excel and Google Fusion Tables and how to create basic data visualizations that are useful for understanding business and economic trends. • ACC 501 Basics of Financial Performance Reporting and Analysis (1.5 credits): This course is the first of two that introduce students to contemporary financial accounting and reporting systems. The emphasis is on the interpretation and evaluation of a company’s external financial reports. No previous accounting experience or knowledge is required. Note: Students may enroll in ACC 501 concurrently with MCO 550. • ACC 504 Basics of Internal Measures of Success: Managerial Accounting (1.5 credits): This course is the second of two courses that introduce students to contemporary financial accounting and reporting systems. It covers managerial accounting concepts and procedures for internal reporting applied to the decision-making activities of professional managers. Note: This is a companion course to ACC 501. It must be taken in the session immediately following completion of ACC 501. • MGT 501 Basics of Leading People, Teams and Organizations: Organization Theory and Behavior (3 credits): The course examines the concepts and applications of management, including motivation, leadership, group dynamics, organization design, decision-making, communication and organization change. • WPC 504 Basics of Understanding Facts: Statistics for Managers (3 credits): This course covers the fundamentals of statistical analysis in making management decisions. Students learn basic statistical concepts and applications, employ linear models to make decisions in uncertain situations, interpret data and write conclusions in non-statistical language, and produce and interpret outputs in Excel. • ECN 504 Basics of Decisions, Market Structure and Games: Managerial Economics (3 credits): The course covers revenue, costs and profits, pricing, value, market structure and uncertainty as well as the role of risk in decision making and competitive strategies from the manager’s point of view. • MCO 593 Applied Project (3 credits): The capstone class brings together the knowledge gained throughout the program. The capstone encourages students to think critically and identify and solve challenging problems in their field. Students produce a final project that incorporates research of an industry or market and offers a practical, real-world solution. The project may take the form of a paper or portfolio of findings or results, or a digital project or presentation. Note: MCO 593 must be taken in your final enrolled session. Below are six possible courses plans. 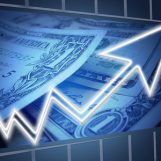 After completing the first course, MCO 550: Issues in Coverage of Business and the Economy, students may move through the program at their own pace, taking into account when courses are offered. U.S. News & World Report ranks ASU as the “Most Innovative School” in the country, ahead of schools such as Stanford and MIT, and its business school ranks in the top 35 Best Graduate Schools for business in the nation. ASU also is the top producer of Fulbright scholars in the country.  The Cronkite School has long offered a business specialization to its students and has trained more than 22,000 journalists and educators through the Donald W. Reynolds National Center for Business Journalism.